The late John McCabe became involved in genealogical research in the 1960s. Being a native of Enniskillen, Co. Fermanagh, and living in Lisburn, he specialised in the province of Ulster, primarily using the resources of the various Belfast record repositories. He originally worked with the Ulster-Scot Historical Society, which was later renamed the Ulster Historical Foundation. Afterwards he began his own practice as a professional genealogist under the name Ulster Family Research Services. John received his education in his home town of Enniskillen. Before beginning his career in genealogy he worked first in the hotel trade. Initially we worked in the Imperial Hotel in Enniskillen, and then afterwards held positions in hotels in the Isle of Man and then the English town of Coventry. He returned to Northern Ireland and became the assistant manager at the International Hotel in Belfast. 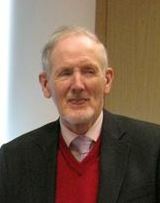 In the 1980s, John, like other Irish professional genealogists, was keen to establish a body in Ireland providing credentials for those involved in genealogical research. In May 1986 he was one of the prime movers behind the establishment in Belfast of what was to eventually be named the Association of Professional Genealogists in Ireland (APGI), which was later in 2015 renamed Accredited Genealogists Ireland (AGI). At the time of APGI’s founding John was the most senior Belfast-based genealogical researcher. He played a central role in encouraging colleagues based in the Republic to form a ‘Dublin Section’ of the embryonic organisation, addressing an initial Dublin meeting later that year. John served for many years on the AGI’s Council, and as the organisation’s Vice-President in 1989. John Terence McCabe was born in Enniskillen, Co. Fermanagh, in April 1940, the second youngest of nine children born to the late John & Mary McCabe. Five of his siblings died shortly after birth (a set of triplets and a set of twins), a fact which helped form the McCabe family into a tight knit, self-supporting, loving family. John is survived by his sister Kate and brothers Pat and Gerry. He is also survived by Liz (Elizabeth Brennan), his wife of 53 years. Unearthing hidden genealogical sources was the trademark of John’s career. In 1988 he gave the Houston Memorial Lecture at the Ontario Genealogical Society’s annual Seminar. There, he presented information on a detailed list of some 700 mainly Irish families that had settled in the Ottawa Valley by 1829. He had uncovered the list at the UK’s National Archives in Kew, London. It was received at the time as “the most important genealogical document on the Ottawa Valley to surface in recent years”. With the permission of Her Majesty’s Stationery Office, it was subsequently published in the Ontario Genealogical Society’s journal, Families, as ‘The McCabe List’. Though he retired from genealogical work on behalf of clients several years ago, he continued to research his favourite topic, the life and career of William Putnam McCabe, a leading United Irishman in 1790s Belfast. In December 2011, in recognition of his standing in the profession and of his contribution to the development of the organisation, he was made a Fellow of Accredited Genealogists Ireland. John died on Tuesday 31 July 2018.